La moissonneuse-batteuse du grindcore arrive en ville en ayant pour but de passer Montréal à la coupe à blanc. Sortant fraîchement des mines du Nord, ces Abitibiens ont vendu leurs fermes pour faire parti de ce pèlerinage grindcore. Avec un mariage humoristique entre le brutal, death, grind, black old school, Abitabyss vont vous démolir la face comme un champ de blé!!! The combine harvester of grindcore is coming to town with the goal of clearcutting Montreal. Fresh out of the northern mines, those Abitibians sold their farms to be a part of this grindcore pilgrimage. 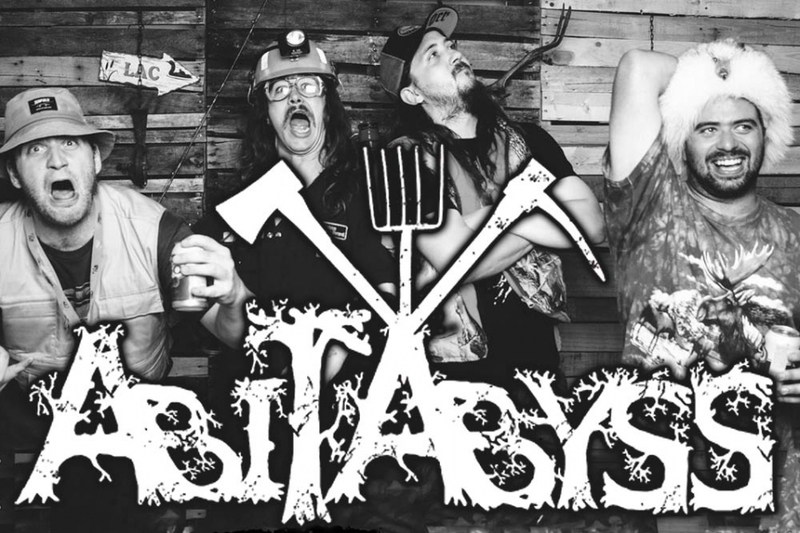 With a funny mix of brutal, death, grind and black old school, Abitabyss will crush your face like a field of wheat. Humoristical death grind band formed in 2004 featuring a farmer (guitars/vocals), a lumberjack (bass) and a miner (Drums/vocals) to represent the 3 primary ressources sector (Farm, wood and mine) of their region Abitibi-Témiscamingue in the northern Quebec area. Not long ago they added a moose hunter on vocals duty and a sick fisherman on guitars/vocals. They use to deliver a very funny wet brutal grinding live performances with multiple vocals assault.